A beautiful country house in large grounds with a private swimming pool and delightful views. This lovingly restored mansion from 1907 has a private swimming pool and is set just outside the Učka natural park, within half an hour's drive from the crystal clear sea. 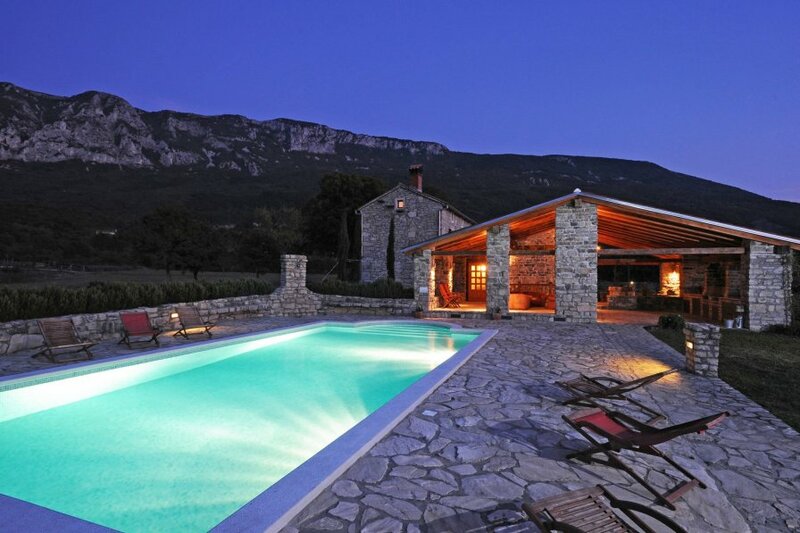 The idyllic setting of holiday home Stancija Sisol ensures complete peace and privacy. The garden will also provide you with the perfect holiday feeling. Relax in the sun on your lounger by the swimming pool and take a refreshing dip every now and again. There's a covered terrace with a lounge area, dining table and BBQ adjacent to the swimming pool. A lovely place to spend your time! There's an additional covered terrace across the entire length of the house, right outside the open kitchen with dining table and the living room with lounge and open fireplace. There are two bathrooms on the ground floor. On the first floor, you'll find two bedrooms with beds made out of solid oak, beamed ceilings and some nice views of the garden - also a great spot to watch the sunset! The attic houses a third, spacious bedroom. There are many sights and activities in the area. Visit for example the Kvarner Rivièra and the towns of Lovran (34 km) and Opatija (40 km). And the Kvarner Islands of Cres and Losinj are just around the corner. There's a regular ferry service to these stunning islands from Brestova (15 km). The islands are characterised by their magnificent nature and interesting towns, such as Cres and Mali Losinj. Don't miss the opportunity to visit the town of Labin (12 km) either. If you fancy a day at the beach, the wonderful pebble beaches of Rabac (17 km) are a good option.